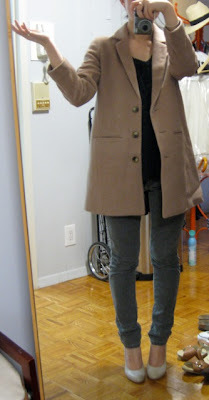 i ordered the greta coat from the alexa chung x madewell capsule collection over the weekend, and it arrived today. i'm about 85% happy with it. the good: the fabric is actually quite a bit thicker and softer than i expected: the wool/nylon/cashmere blend is a plushy, predominantly natural-fiber classic camel beige that is genius timing given all the fashion press' touting this fall as the season of camel. the bad: unfortunately the coat sold out in the 0 and so i got the 2. it's not so big that it fits like the wrong size, but i feel like i'd love it more if the sleeves were a bit slimmer and about half an inch shorter so that it fits like how it's supposed to: as a shrunken, almost 3/4 sleeve length. it's quite boxy in the body as well. again, given that it's a winter coat, this isn't a huge issue as it will be better for layering, but a more slim cut in the torso would be ideal. overall, i think it's a classic piece that is very versatile and will be a wardrobe workhorse item in the colder months. i have another, more formal knee-length camel coat from Banana Republic that i got a few years ago on final clearance that is made from a similar blend, but the fabric is much more stiff. the greta coat seems like it would be a cozy weekday option, so i'm leaning towards keeping it for the time being. the material is a little wrinkly from the way it was folded/packaged, which hopefully a quick trip to my dry-cleaners will fix. does anyone know if you can iron wool blends like this? I have to say, I think it looks great. So nicely proportioned. it looks great! i don't know how easy it would be for a tailor to take in the sleeves, but at least you could get them shortened...that might make it look more to your liking! I ordered the coat and got in the mail yesterday as well....I'm not sure how I feel about it either! Online the coat seemed like a richer camel color than in person and I too felt I could have ordered a size down...I think I may return it for the grey/velvet coat instead. Overall I think it's cute but I was just expecting something quite different! turqoisethunderwolf: i know! the picture on the madewell website made the coat look a lot more fitted. either that or the model was so tall that the proportions fit completely different on her than IRL...i really like the material though, it kind of reminds me of a cozy blanket! grechen: i think this is the fuzzy issue. i think i'm going to have to 'style' it with some more layers in the next week or so to see how it fares with thicker sweaters, etc underneath. it's always annoying when an inch here or there ends up making a much bigger difference in fit than it looks like on paper. I will copy your pose in the last photo.Lol!